A tomato strainer is one of those kitchen gadgets which should adorn the kitchen of anyone who makes their own sauces and salsas. 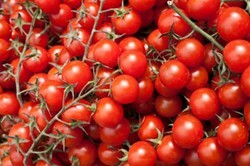 Learn which tomato strainer is best here. Homemade salsa and pasta sauce is so much tastier and better for you than buying store brands. The problem is, the process can be pretty time consuming if you do the whole thing by hand. If you know how to peel tomato skins then you know how fiddly and complicated this can be, especially if you have a large amount to work with. Removing the seeds is another nuisance and if you leave them in they can make the sauce bitter. Personally, I have the whole process of peeling and seeding tomatoes and that why I started looking into better ways to do it and eventually stumbled upon tomato strainers as a solution. If you haven't seen these before then let me tell you a tomato press or food strainer, as they are also otherwise known, is an absolute godsend to anyone who makes homemade sauces, jams, jellies, salsa, pie fillings etc. The reason why these are so awesome is that you can throw in fresh fruit, turn a handle (or press a button on the electric food strainers) and it automatically separates out the yummy pulp from the unwanted skin and seeds. 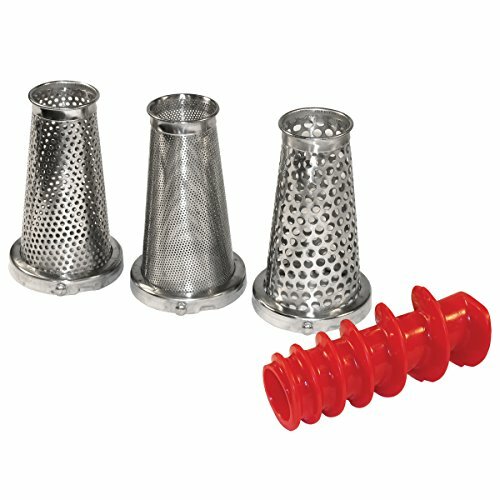 Which Tomato Strainer Is Best? There are a variety of different models out there but there the one I eventually chose for myself is a hand turned manual tomato strainer, the Roma Food Strainer and Sauce Maker for Fresh Fruits and Vegetables. I liked this model the best because it not only has some of the best reviews but also comes at a great price too. I also noticed there were accessories I could buy to extend the usefulness of the product which would allow me to use the food strainer with more than just tomatoes alowing me to strain everything from berries with tiny seeds to fruits with larger seeds and tougher skins. This versatility has proven to be very nice and I did indeed buy extra strainer screens to strain fruit for making jams and preserves and to strain squash for making soups. The product and the extra accessories I bought are shown below. Feel free to check them out and to read the generally positive reviews of the product. Now, the tomato strainer I bought was perfect for my needs because I like to make homemade pasta sauce from scratch for my family and to store a few for later. 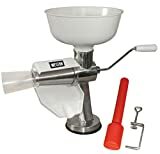 A manual strainer is great for this but if you have bushels full of tomatoes or fruits to process then the chances are you are going to get pretty tired of turning that handle in no short time. For more labor intensive operations like this, you are better off looking at the range of electric food strainers out there on the market today. These are not operated by hand but instead are plugged in and use a motor to turn the grinding mechanism. An electric tomato strainer will speed up the process significantly and if you have a physical injury or condition which might make turning a handle repeatdly uncomfortable, then these are ideal for you. 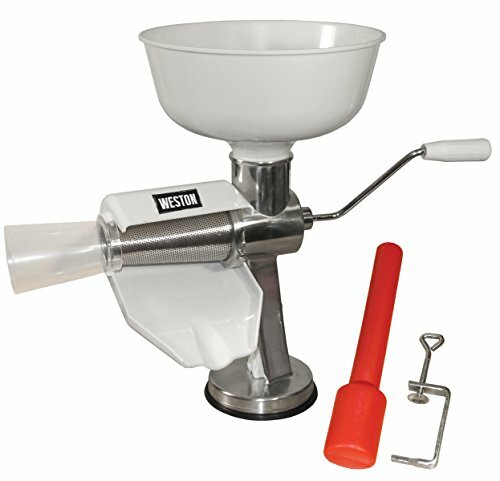 Electric tomato presses are not the cheapest option by any means, but ask anyone who has stood in their kitchen with a manual tomato grinder turning the handle for hours as they work through bushels of tomatos or fruit for canning and you'll soon hear them start singing the praises of electricity and motor powered tomato presses. 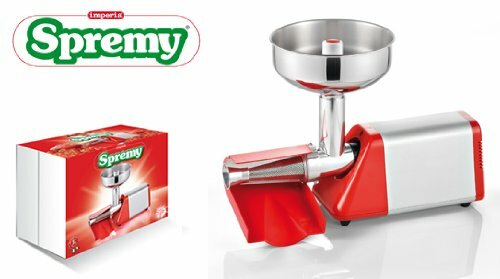 A well reviewed electric tomato strainer comes from Spremy which again, whilst not cheap, has a nice sized hopper and a motor which is more than capable of grinding through tomatoes at a rate which will speed up your canning and sauce making with no tired arms from cranking a handle. Actually they're not all difficult to clean, at least not the one I have. It all comes apart quite nicely so you can clean the individual parts. these strainers sound interesting, but aren't they difficult to clean? Also referred to as pie funnels or pie vents, pie birds allow steam to escape from baked pies and prevent the filling from bubbling over.